Fall is on the horizon, and with colder weather approaching it only seems natural to cling to a warm coffee cup. Coffee culture surrounds us and dominates the rituals of people around the world, one pumpkin spice latté at a time. Whether it’s from your coffee pot at home, your favorite corner coffee shop, or straight from a French press at work, caffeine is used by many trying to remain productive at work. However many people take it a bit too far and become full on caffeine junkies. These are the coffeehouse hounds, the veteran baristas, the hotel coffee fiends. Many people, especially those in office work environments, view the addictive ties of binge drinking coffee as very normal. Society sees little to no problem with overconsumption, while the fact remains: caffeine is an extremely addictive drug. The starting point is identifying exactly why you want to quit caffeine and the ways in which you consume it. Caffeine causes issues everywhere in the human body. From headaches, to digestive problems, to contributing to osteoporosis, coffee contributes to some damaging health issues. 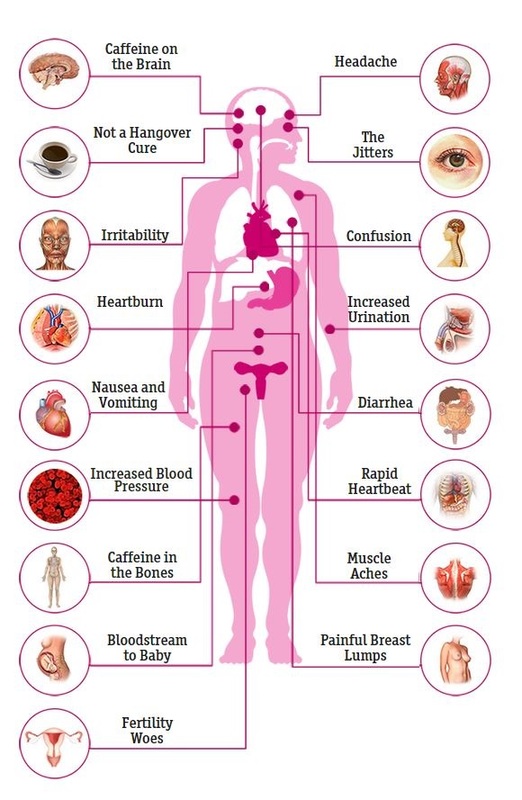 The following graphic from Healthline shows the scope of how caffeine troubles the whole body. While alternatives aren’t exact replicas to a coffee connoisseur’s taste buds, they are a huge aid in kicking the coffee habit. Be sure to start small and gradually make the transition to new beverage choices. For example, if you typically drink three cups of coffee a day, begin weaning yourself off by replacing one of those cups of coffee with tea or another alternative. Maté: is a delicious and somewhat caffeinated drink. It also contains a lot of antioxidants, essential minerals, and other beneficial nutrients. I prefer to drink it hot with a small amount of agave for sweetness. Tea: the obvious choice for an alternative. Certain black teas taste oddly similar to coffee, and many tea blends still contain quite a bit of caffeine. Furthermore, check out this coffee lover’s guide to tea. Other Healthy Drinks: I absolutely love kombucha, and am very partial to cold pressing fresh juice. Find that special drink, caffeinated or not, and make that a new go-to beverage. When all else fails, drink more water! A huge pitfall to quitting coffee habits is that feeling of regret when it’s 7 AM on a Monday morning. You’re late for work and are still half asleep upon arrival. The bar for productivity has been set, and waking up is less of an option, more of an expectation. It is true that coffee and other highly caffeinated drinks help to alleviate the pains of an early morning, but realistically it’s only a short term fix. Kicking the caffeine habit will help ensure long term level headedness. Once you are past the initial wave of detox and side effects, something positive happens. A lack of caffeine in your body helps you think more clearly. Addressing conflicts in the workplace will become much easier when excessive coffee drinking habits are broken. The biggest issue is the way that moods change when coming down from a caffeine binge. Identifying coffee addiction is the first step, but creating a consistent means to log your progress will help long term. Set a goal and stop drinking coffee!